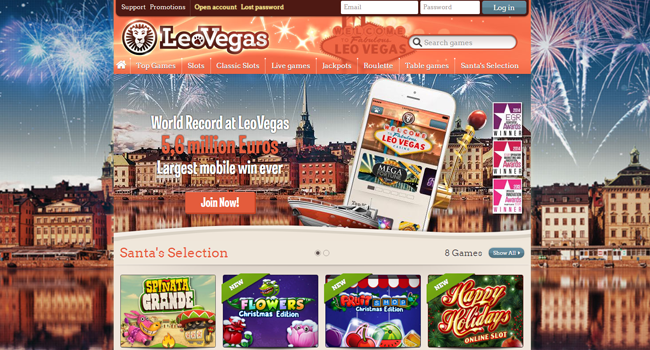 Leo Vegas Casino established its mobile casino in 2012 and quickly widened its base to include website gaming as well. They are renowned for their easy accessibility, impressive selection of games, and bonus structure. In 2013, they won the EGR Innovation Award. Also in that same year, they earned the Best Gaming Operator of the Year Award from ICE Totally Gaming. By working with over 15 different software companies, Leo Vegas Casino offers attractive graphics for its myriad of games. A user can play on a variety of platforms including Androids, IPhone, IPod, and Windows phones. They cater to certain countries in Europe, including the UK, Sweden, Finland, Norway, Switzerland, Austria, and Germany. Besides these European countries, Leo Vegas Casino welcomes players from Canada and Australia. Part of the rapidly growing appeal of Leo Vegas Casino is its generous bonus structure. Their Welcome Bonus gives new players up to 200 free spins usable on certain games such as Starburst, and a total of up to £1500 depending upon their country. The bonus is divided into four separate installments. Immediately upon registration, new players receive 50 free spins. For the ten following days, 20 spins are added each day. First deposits receive a 200% match up to £100 and the remaining spins. Second and third deposits earn a 100% match up to £500. Fourth deposits earn 50% up to £400. Players must make the minimum deposit of £10 in order to collect the Welcome Bonus. The free spins are usually used on Starburst. A new member does not need a special code to receive the Welcome Bonus. It will be automatically given, although a player may opt out if he or she chooses via the Settings menu. Although there is no clear rationale provided for this, the Welcome Bonus does vary for certain specific countries. Players from the United Kingdom receive the 200 free spins, but they may play them on Twin Spin or Jack and the Beanstalk in addition to Starburst. The free cash bonuses in this case total about £1500. Gamers from Australia receive the 200 spins with a somewhat different selection of slot machines. Besides Starburst, Australian players may use their free spin on Vegas Party or Mega Fortune Dreams. Also, Australian players get up to 1000 AUD with the four deposits. The Netherlands are given the same bonus as Australia except their free cash is in euros instead. Swedish players are eligible for spins on the premier NetEnt slots and up to 10,000 SEK over the four deposits. Norway’s bonus includes the 200 free spins on Starburst or Vegas Party and €4,000 divided free cash. Players from Switzerland, Germany, and Austria may use the 200 free spins on Starburst or Vegas Party and receive €1,200 cash. Any money won from these free spins is subject to the bonus wagering terms. Players will need to play the deposit plus the bonus 35 times. Once a player meets the wagering requirement, money may be withdrawn. Whereas slots give 100% to the wagering total, other casino games such as video poker and table games only give up to 10%. Leo Vegas Casino also occasionally emails players with free money or free spin offers. Free money is subject to a 45 time wagering requirement, but the free spin winnings remain at 35. In addition, the casino offers a VIP loyalty program. Players earn points every time they play. Currently there are 99 levels. VIP rewards include regular bonus emails and special treatment from Customer Service should one ever need to contact them. VIP payments are processed faster, and after attaining Level 30, all of a player’s withdrawals are free of processing fees. Headquartered in (Malta Registration Number: C59314), Leo Vegas Gaming Ltd. is officially licensed in Malta (LGA/CL1/882/2013) and the United Kingdom (000-039198-R-319450-001). Malta’s gaming commission is well known for regulating its gaming businesses to ensure fairness. When playing on Leo Vegas Casino, users can expect streamlined interfacing, appealing graphics, a wide selection of games, a secure connection, responsive customer service, and quick payouts. Leo Vegas works on a variety of platforms. Because it is flash-based and not downloadable, it offers easy access for many countries. Even Mac and Linux users will find the game play smooth. The site is easy to navigate and intuitive. Because they began as a mobile gaming provider, Leo Vegas boasts mobile graphics of a higher quality than many companies who started on the web and then added the mobile interface. Often games on those other mobile sites use simplistic graphics. The choice of games will impress even a seasoned online gamer. They utilize a number of top software providers including NetEnt, IGT, Ply’n Go, Microgaming, Cryptlogic, Betsoft, Bally, Yggdrasil, NextGen Gaming, and Evolution Gaming. Working with this many software companies means that Leo Vegas has over 500 different games to please almost anyone. Slot choices include some of the most famous online selections, like Creature from the Black Lagoon, South Park, Sugar Pop, Fisticuffs, Flowers, and Blood Suckers to name a few. They add new games regularly. Besides slots, Leo Vegas includes traditional games such as roulette, blackjack, baccarat, poker, and video poker. To make the experience even more exciting, over 15 games provide progressive jackpots, including Mega Moolah from Microgaming and Hall of Gods from NetEnt. The jackpots quickly grow to large amounts. For those who prefer live action, a live casino lets them play games against real dealers. So far, the available live games are Casino Hold’em, Roulette, Blackjack, and Baccarat. A variation of live Roulette called Immersive Roulette boasts unique views of the ball and continues to be a popular choice. To protect customers’ security, Leo Vegas uses a 2048-bit SSL encryption on all transactions. They also safeguard player deposits in an account in Sweden to further thwart online thieves. Under the settings menu, players may limit their spending if they choose. Customer service may be reached 24/7 through a free UK phone number or a landline in Malta. They also respond quickly to emails. Supported languages include Swedish, German, Finnish, English, Polish, and Norwegian. Banking choices are GiroPay, Paysafecard, Visa, Mastercard, iDeal, Skrill, PostePay, InstaBank, and Neteller. These currencies are accepted: AUD, GBP, EUR, SEK. Other currencies will be automatically converted. Payout times average from instantaneous to 24 hours.